A map of the Kingdom of Ireland, divided into provinces, counties and baronies. Southern section. Shewing the archbishopricks, bishopricks, cities, boroughs, market towns, villages, barracks, mountains, lakes, bays, rivers, bridges, ferries, passes, also the great, the branch & the by post roads together with the inland navigation, by J. Rocque, Chorographer to His Majesty. An absolutely stunning and monumental 1794 wall map of Ireland by Jean Rocque. Covers Ireland in full with extraordinary detail throughout. Notes every town, hamlet, bishopric, country, forest, castle swam and road. Even offers some offshore detail with regard to the shoals in Georges Channel. In inset map in the lower right quadrant shows Ireland in the context of the British Isles. An elaborate title cartouche in the upper left quadrant shows the Irish Harp over two pensive bovines and a demurely positioned unclothed maiden. Published by Laurie and Whittle as plate nos. 9-10 in the 1797 edition of Thomas Kitchin's General Atlas. John Rocque (c. 1704 - 1762) was an important cartographer, engraver, and surveyor active in England and Ireland in the mid to late 18th century. Rocque is of Huguenot extraction and likely changed his name from Jean upon moving to England from the south of France in 1709. John Rocque seems to have started off life as a landscape designer, working and living with his brother Bartholomew. When Rocque discovered he had a talent for cartography, he sold his skills in conjunction with his brother's landscape design work to various public parks and noble estates. Rocque is well known for his detailed plans of Plainshipp Park, Wilton House, Wrest Park, and Claremont, among others. As his cartographic skills grew he turned his attention to larger scale productions, developing a number of impressive city plans, including the exceptional large format plan of London, for which he is best remembered. Rocque enjoyed considerable business success during his lifetime. Where most English mapmakers were simply reprinting updated versions of older work, Rocque was embarking on time consuming original survey work. He also developed a number of unique approaches to cartography with regard to new techniques for rendering land use and topography - no doubt a layover of his landscape mapping work. Little is known of his personal life, though he did marry twice. His widow, Mary Ann Rocque, carried on his business following his death in 1762. Very good condition. Original centerfold. Blank on verso. Original platemark visible. Wide clean margins. Four sheets joined. 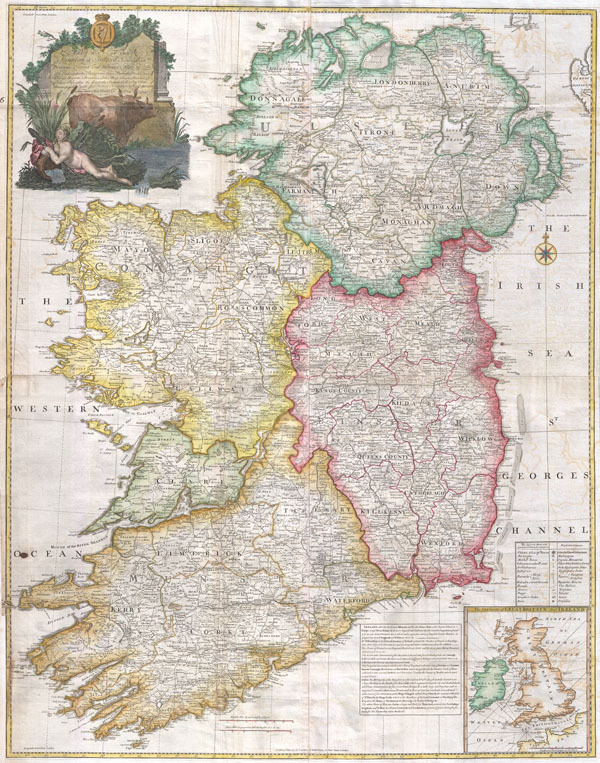 Bonar Law, Andrew, The Printed Maps of Ireland 1612-1850, 93(ii). Rumsey 0411.014, 0411.015. National Library of Australia, MAP RM 2338.